While researching the burning of witches in Dumbarton in the late 1670s, I began to wonder where the burgh’s execution ground lay. 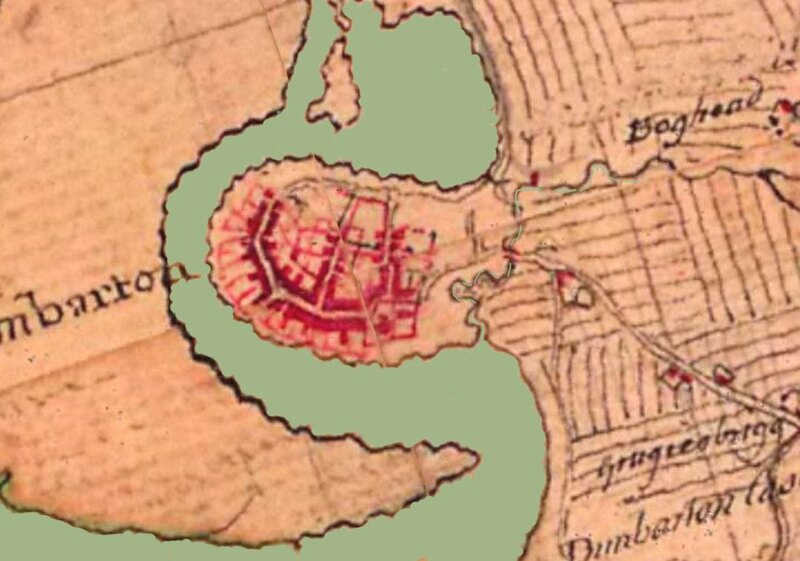 As the head burgh of a shire, Dumbarton would have had a gallows site located somewhere outside of the burgh. Where was it? Where was ‘the point of Croftingrie’? It is reasonably clear that the new gallows were constructed near a river, possibly or probably the River Leven, at a place where there was a defined ‘point’. In practice, a point could mean a loop in the river, as further up the Leven lies Dalquhurn Point which is a loop in the river. The other clue as to its location is that the point lay on ‘vpoune the common’, i.e., the common land held by the burgh. In the nineteenth century, ‘Dumbarton Common’ occupied what is broadly now the golf course on the east bank of the Leven. However, it is likely that the common land also extended south from there beyond the town mill and included at least the area on the west side of the Knowle Burn outside of the burgh. On the map, above, the Knowle is marked on the right of the burgh. The problem is that no location called the ‘point of Croftingrie’ can be located on historical maps in the vicinity of Dumbarton. All that is known is that Croftingerie lay somewhere on the common. I am not expert on placenames, but ‘Croftingrie’ might be “Croft an Righ”, the King’s field or croft? The Gaelic placename Croftanrigh can be found in several locations across Scotland, at least once corrupted as Croftangry. There is also a ‘Croftingea’ in neighbouring Bonhill parish, but it lies much further north in Alexandria. On its own, the evidence of the new gallows from 1604 does not pinpoint where they lay. There is, howevver, a reference to a location called the ‘gallows’ mollan’ in 1758. The word ‘mollan’ is recorded in the Scots of Galloway for “a long straight pole, such as fishermen use at their fish-yards”. In other words, it is possible that Dumbarton had a gallows ‘pole’, but the scale of the pole and origin of the word do not sound right. It appears that Dumbarton’s gallows, at least in the Eighteenth Century, may have been located close to a shingly beach. In 1758 the gallows, if they survived, lay close to where the proposed new East Bridge crossed the Knowle Burn. The course of the Knowle Burn, aka. the Mill Burn, has been the subjected to considerable human intervention. On Roy’s map of the 1750s, its meandering course down to the River Leven is obvious, but by the nineteenth century its course had been straightened and diverted into underground culverts. Today, the lower reaches of the Knowle Burn follow a largely subterranean course from the Asda supermarket to the River Leven. The East Bridge over the Knowle was constructed ‘to favour the entry and policies of the town’. However, today, like the Knowle, it has vanished under Dumbarton’s eastward expansion. Fortunately, it can be found on plans of the burgh of 1777 and 1818. The earlier map is probably the more useful, as in the latter map, dykes built to reclaim land had significantly altered the shape of the landscape where the Knowle flowed into the Leven. 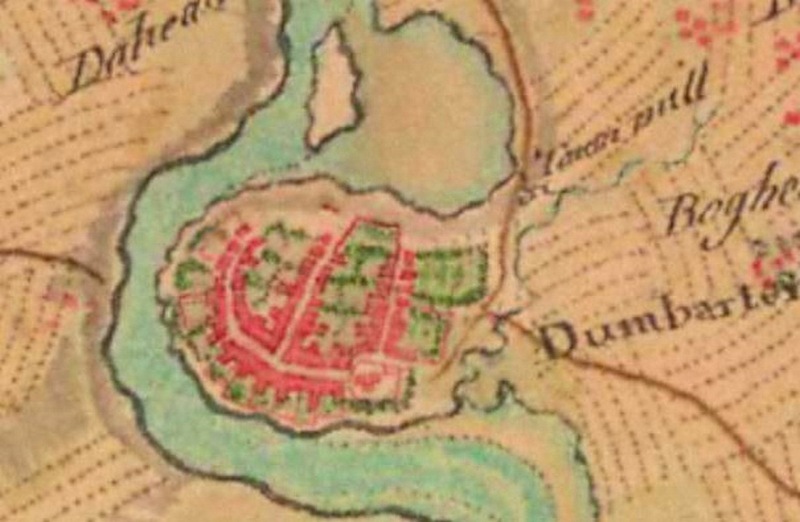 The 1777 map, above, shows that the East Bridge lay on Castle Street in Dumbarton. Today, the location where the bridge crossed the Knowle or Mill Burn is approximately here. In the mid eighteenth century, the gallows lay close to where the East Bridge crossed the Knowle at Castle Street. The 1777 map shows new buildings extending from east of the kirk to the bridge. The gallows were also probably close to a shingly beach. From the 1777 map, it appears that the mouth of the Knowle at the Leven was both wider and tidal at that point, which is probably the ideal location for a singly beach to be found. Was the gallows site in 1604 the same location as where the gallows were said to be in 1758? Was the ‘point of Croftingrie’ next to were the ‘gallows’ mollan’ lay? Maps drawn up in the decade before the new bridge at the Gallows’ Mollan was built, give a brief glimpse into how the landscape looked around the mouth of the Knowle prior to the construction of the bridge. Although those maps do not show how the area looked in 1604, they do indicate that what could be called a point existed at the mouth of the Knowle. Looking from the perspective of Dumbarton, the point is more obvious. At that time, the Knowle was crossed further up stream, roughly where the modern Glasgow Road crosses the Knowle today. 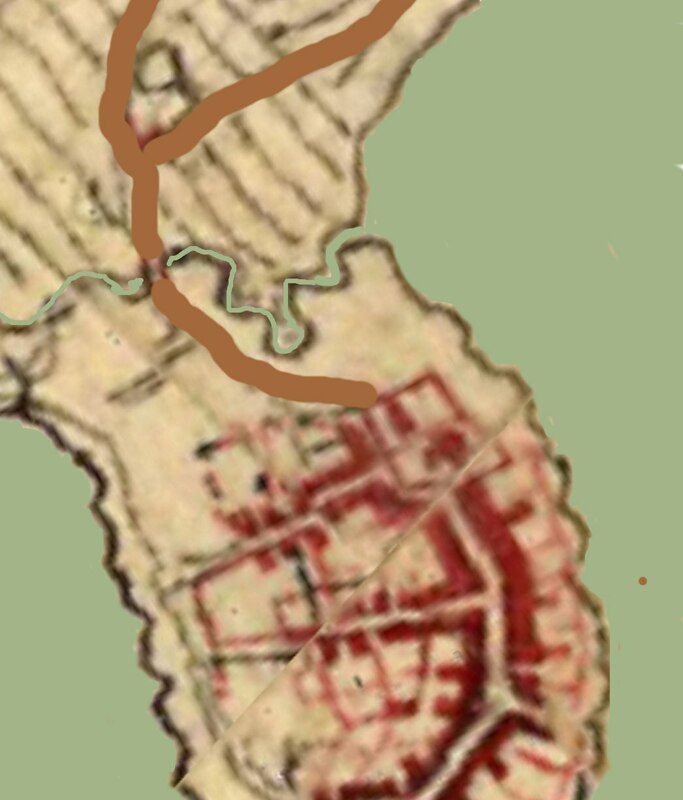 The maps also show that a band of what was probably common land stretched between the Town Mill, on the left, to the mouth of the Knowle, on the right. It is possible that the point of Croftingrie, which lay on the common, lay next to the Gallows’ Mollan. Execution sites were often at the boundary, the edge, of a burgh’s domain, For example, Wigtown’s Gallow Hill lay on the southern edge of the royal burgh’s lands. It appears that in Dumbarton a similar pattern was followed, with the gallows on the edge of the common by the river. There is a second reason to believe that the 1604 and 1758 reports refer to the same place. Executions were ritual affairs where everyone, crowd, officials and condemned, knew their role in the drama. The execution site carried its own sense of dread and was part of the theatre of the ritual. Once fixed in the public mind, changing that ritual may have been difficult. In Dumbarton, the condemned and the crowd probably took the route from the Tolbooth on the High Street out beyond the parish church and the edge of the town to the execution ground on the point. Having a gallows was a civic status symbol of the royal burgh’s importance as a centre of justice. The gallows were probably located on the point between the mouth of the Knowle and the River Leven. Off to the right of the road, it was a location were justice could be seen to be done, both entering and exiting Dumbarton, and from boats plying their trade on the Leven or the Castle fortress. From the burgh records it is clear that Dumbarton had a ‘public place of execution’. In August 1687. 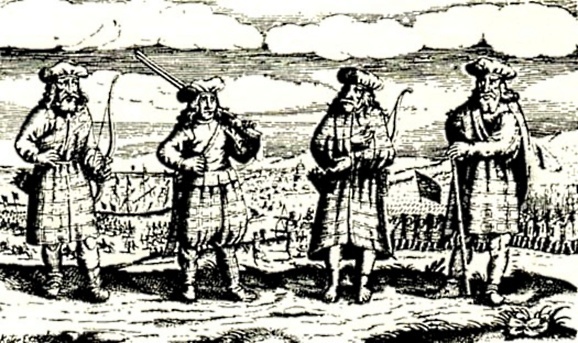 ‘Tryal of Duncan Glass M’Allum’, a Gaelic-speaking Highlander involved in an armed raiding party that stole cattle and robbed a house, ended in him being hanged at ‘the public place of execution of the burgh of Dumbartone’. Archibald M’Aulay of Ardincaple, baillie. The last man on the assize was also involved in the deaths of two Covenanters at Eaglesham in the Killing Times of 1685. ‘The whilk day Duncan Glass M’Callum being brought to the bar, and interrogate if he had any thing to object against the assizers, he declared he had nothing to object against them. The panel confesses that part of his indictment as to his coming to Rosneith and being in company with Johne M’Sorriche, William Baine, and the rest of the pairty, and that afore the hership lybelled; that he got his shaire, three young kyne and a stirk, and confesses that there were uplifted at the foirsaide time about a hundred kyne and horse, and some sheep; and confessed that he was in Patrick Cummins house with the rest when it was robbed, but denyes he midled with anything himself that was therein, and that those who robbed it were the personnes that took away with him the foresaide herschip: and this judicial acknowledgment is given in by the mouth of Johne Zuille of Darleith, the sworne interpretar. The whilk day the said Duncan Glasse M’Allum, being before the said assyzers, and thereafter removed to close prison, and the said assize being all removed lykwayes to ane room, and the door locked upon them, and they returned with ane voyce by their verdicke under the hand of Johne Zuille of Darleith, thair chancelar, finds that pairt of the first article of the panels indictment, touching his coming to Rosneath, and being act and pairt to the depredation after named and charges lybelled sufficiently proven, with robbing of Patrick Cummins house. Lady of the said regalitie and her said bailyie. And this the domester gives for doome. I wish to offer thanks to Neil McFadyen and John Cummings for kindly sharing their knowledge about Dumbaton and helping to clarify my thoughts on the location of the gallows. ~ by drmarkjardine on June 5, 2015. Is Mollen not a mill as in Mollendinar in Glasgow, Gaelic & French, Moulin? Hello. Brilliant article. You might want to get in touch with Chris Cassells in West Dunbartonshire Council who has the location of the gallows as the old gas works at Dumbarton. Chris is the archivist in the heritage section. Good guy aswell as knowledgeable!